We have been without sufficient wifi to load pictures until today, so I will catch up on our blogging! We headed North from Hinton on June 15th, traveling through Grand Prarie, into British Columbia, and stopping for the night in Dawson Creek. The Alaskan Highway begins in Dawson Creek, and w e planned on driving it in sections of 300 miles. Day 2 we made it to Fort Nelson, and ended up camped at a RV Park next to a museum. Lots of old US Army stuff from the WW2 construction of the highway! Day 3 we drove through Stone Mtn Provincial Park and camped at Muncho Lake Provincial Park, only a 150 miles down the road! Muncho Lake was just too pretty to drive by without stopping, and we were all glad for the respite from the road. We camped right on the lake and watched Bald Eagles fishing. Day 4 it was back to logging miles, but our journey was sprinkled with bear sightings! 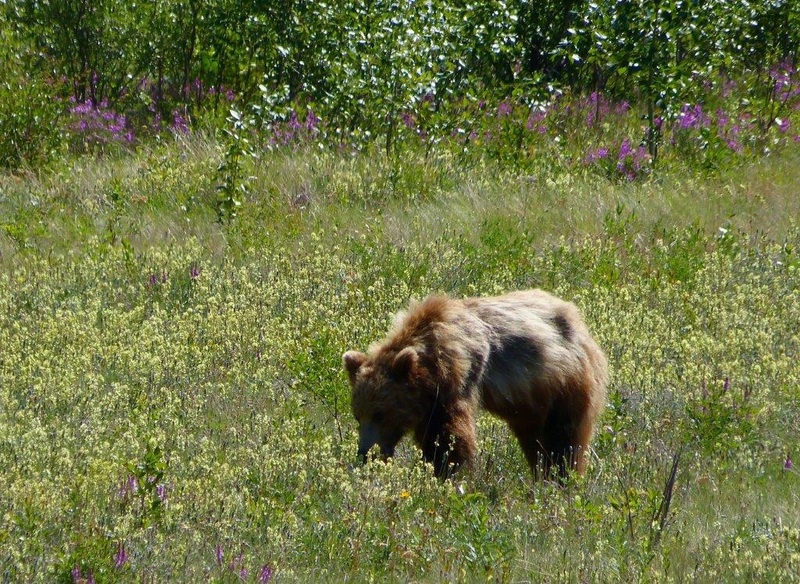 We saw at least 6 bears along the way, and Charlie got some good pictures. We also saw lots of buffalo. 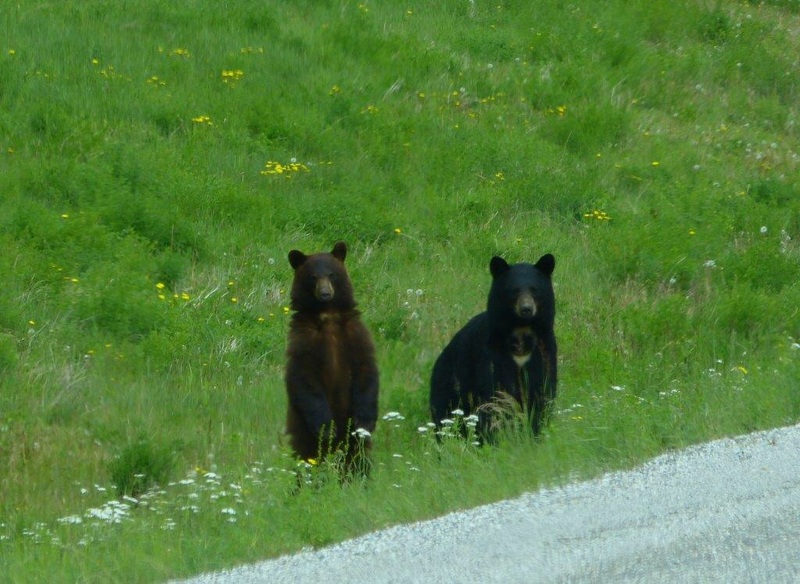 Two young bears on the side of the Alaskan Highway. We stopped at the Sign Post Forest at Watson Lake, but didn’t have a sign to add. Ended up camped in Yukon Territory for the night, then had really rough road conditions on Friday and Saturday. After Whitehorse the road was filled with frost heaves, broken pavement, or no pavement. We could only drive 10 mph on the gravel sections due to the wash board bumps, and flying gravel was a constant concern from passing trucks. We ended up with the Jeep coated with dust, we even put a baggy over the air intake to keep the dust out! We had read about the road conditions, but until we drove the Alaskan Highway, we did not fully appreciate how bad the conditions could be! 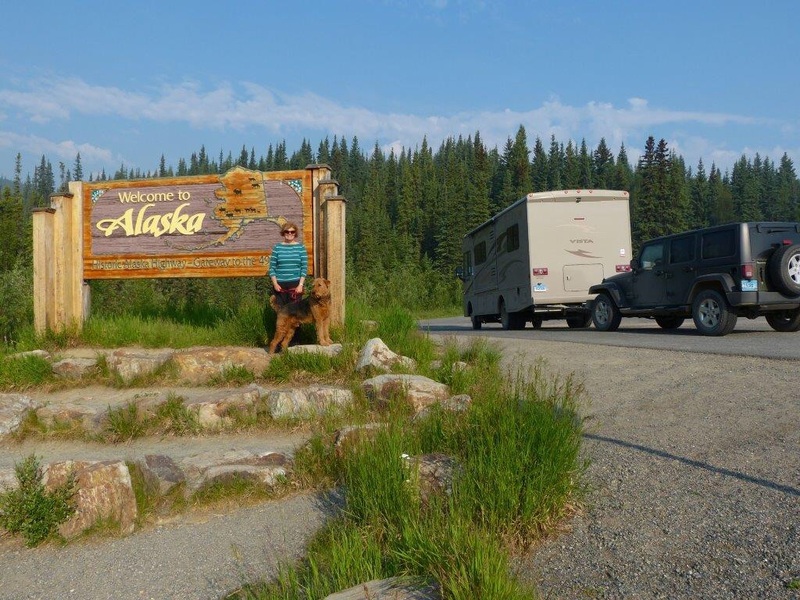 We stopped 50 miles south of the Alaskan Border and camped at the Yukon/ White River RV Park. The owners collect old US Army vehicles, old boat motors and tools, and all sorts of other interesting stuff. We enjoyed walking around looking at the collection. We drove across the Border into Alaska without any problems with Customs, and continued 90 miles into Tok, Alaska. We arrived at the Yukon RV Park at 11:00 a.m. and decided to stop driving and check out our first Alaskan town. It was a good thing that we stopped, because the Jeep had a flat tire from a rock cut from the gravel! We were fortunate to be camped near Northern Energy, where a very competent technician looked at the tire ano showed us it was not repairable. He had difficulty locating a replacement tire, and we had to wait until Monday for the new tire to arrive at Tok! We we were very fortunate that we noticed the tire in time to prevent the rim from being damaged! This entry was posted in Uncategorized on June 24, 2015 by Ramblin' Rose. Sounds like quite the adventure! Not being able to get parts is the biggest downfall of doing this trip. Too many bears for my liking. 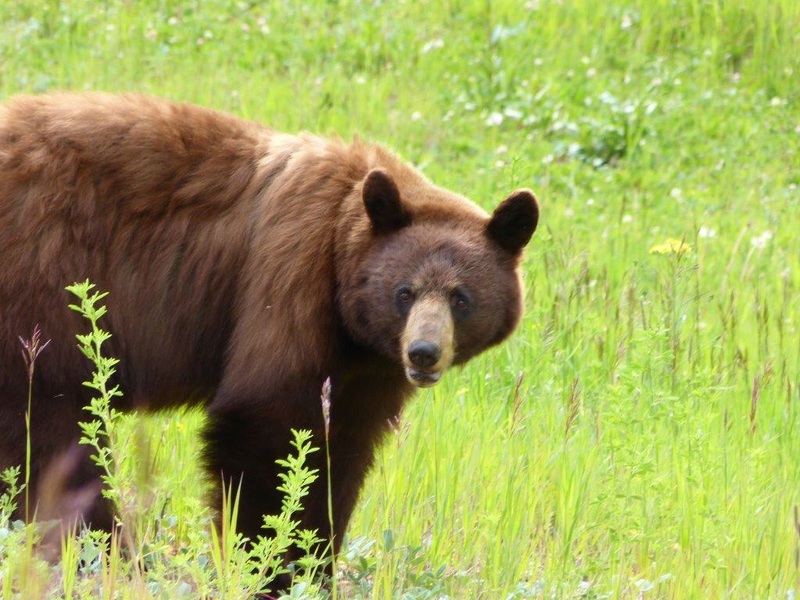 We were watching a show last week that gave the population of bears in Alaska and it was extremely high. Enjoy, as I know you are! It really is an adventure! Thanks, Pam. Will try to keep distance between bears and Charlie! Unbelievable pictures and scenery Sara. Congratulations on making it to the last great frontier. Wow! Unbelievable that the “highway” has sections with no pavement. A true adventure. 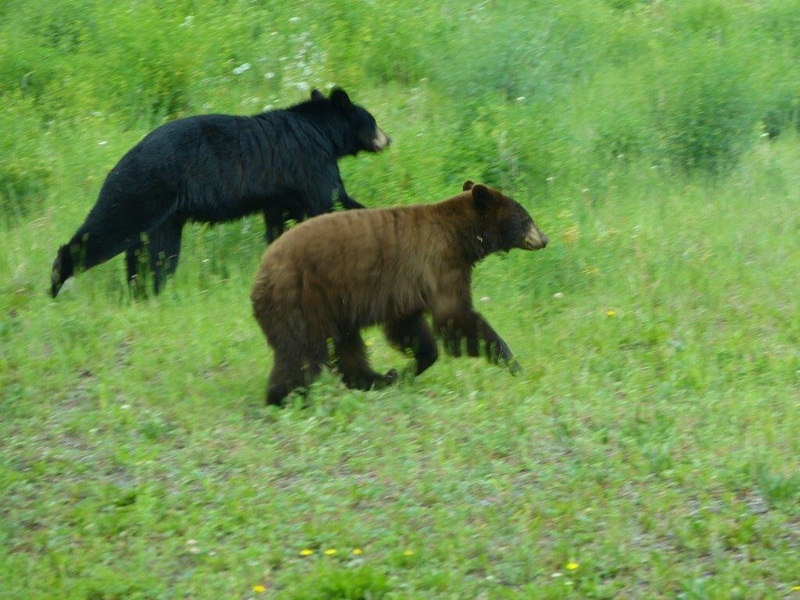 I didn’t know that the black bears and the brown bears hung out together. Maybe we can learn from them… Love the posts! Keep ’em coming! glad I didn’t stow away with the bikes. Michael said you haven’t been on the Alaskan hwy. until you get a broken windshield. I hope he is wrong. Great pics. keep going north. So good to see that sign behind you! What a journey this has been for all of you. I recall looking down at the Alaskan Highway from the plane in 1951 on my way to Manila. Was just a roadway in the wilderness. Maybe still is!? I like Charlie’s bears and other 4 legged critters. Congratulations! You made it! Sounds like you’re having a great adventure and pictures are great. Can’t wait to hear more. Stay safe (keep Charlie away from the bears)!! TAAAA DAAAA! You did it! GREAT! Quite the adventure getting there! Your photos are absolutely mind-blowing and majestic! Looking forward to your next post !!! My parents also told me they are having a great time on this trip, woolly bear is too !